The low-profile SatetyGlide™ deck eliminates wasted time and money spent on side skirts, and irritating watermarks. Simply turn the steering wheel; as the machine turns, the deck automatically moves in line with the path of the rear squeegee, resulting in 100% water pick-up. With a spring-loaded safety design, you no longer have to worry about accuracy or accidental contact for edge cleaning. The deck ensures precise, straight edge cleaning without additional labor-intensive detail edge mopping. When purchased with the BOOST oscillating head, the Focus II MicroRider delivers high levels of cleaning with the ultimate in green benefits. Say goodbye to costly chemicals, slippery floors and undesirable odors. BOOST allows for easy floor finish removal without the use of chemicals. Plus, this efficient technology uses up to 70% less solution, extends equipment pad life by 40%, provides longer battery run times and cuts labor time in half. 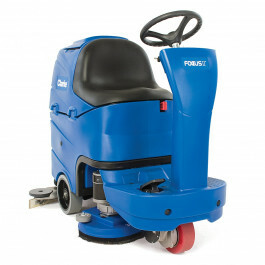 For more great machine from Clarke, please check out our full listings of their walk behind and ride on auto scrubbers. BOOST Technology with chemical-free floor finish removal makes the rider a dual-function scrubber. SafetyGlide™ scrub deck ensures quality cleaning results with 100% water pick-up. Easy operation with Safe-T-Steering™ increases operator safety. Quiet operation makes daytime cleaning and cleaning of noise-sensitive areas viable. Optional Chemical Mixing System automatically delivers the correct mixing solution to the brush deck. Comfortable driver compartment with customizable features can be optimized for virtually every operator.